While other teenagers might spend their holidays at home with their feet up, 94 per cent of students from St Patrick’s Technical College in Adelaide’s north will be getting their foot in the workplace door. The College’s Term One Work Experience program has been its most successful in the 10 years since the school opened its doors. Over the next three weeks, more than 164 students from years 11 and 12 will take part in work experience across Adelaide. The students will be involved in a wide variety of industries from hair and beauty, construction, electrical, plumbing, automotive, metalwork and the food industry. College Principal Rob Thomas described the numbers of students undertaking work experience as “outstanding”. “It’s a great opportunity to go out into the workforce to learn about the workplace, about bosses and what’s required of employees. It also establishes networks that may lead them onto future employment,” Mr Thomas said. 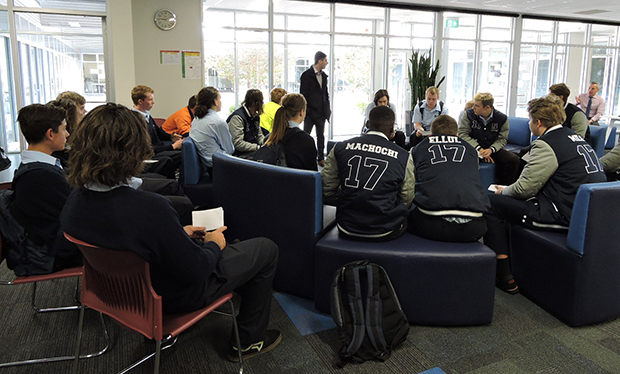 StPatsTech’s unique approach to education sees it place the employability of its students as top priority. This means the school requires students to undertake at least six weeks work experience each year. The last week of the term is given over fully to work experience, but Mr Thomas said some students would continue their work experience into their school holidays. While the full-time students go out to experience work, the College’s School-based Apprentices (SbAT) returned to complete competencies towards their SACE. The SbAT students spend up to 40 weeks a year with their employer and return to the college for six weeks to finalise their SACE. The SbATs also heard from Old Scholar and 2016 South Australian Apprentice of the Year, Jack Donaldson, who spoke to them about nominating for the SA Training Awards 2017. StPatsTech has a number of students who have nominated for the awards and who received mentoring from Jack. The end of the term caps off a successful start to 2017 for StPatsTech. In March the college launched its 10th anniversary celebrations with the release of an interim report tracking some of the more than 1400 past students. The report showed that of those students who started an apprenticeship, 93 per cent went onto to complete the certificate and 99 per cent of past students were in employment. This entry was posted in Latest News on 11/04/2017 by St Patrick's Technical College. St Patrick’s Technical College has welcomed news that Boeing will be locating a hub in Adelaide and employing 250 people over the next five years. 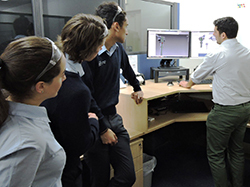 StPatsTech’s Business Development Manager Patrick Kelly said seeing another big player in the Defence industries enter the Adelaide market was exciting for pre-vocational training schools. Ahead of a major announcement in partnership with Saab Australia, Mr Kelly said schools like StPatsTech are playing an important role in providing training programs that match current and future labour market needs. The school’s recent inclusion in the Australian Government’s P-TECH program and its work with the South Australian Government’s Advanced Technology Project, has seen a strong focus on science, technology, engineering and maths skills of students. “We are bridging the gap that industry says isn’t being filled by university-level training. There is a space to be filled by skilled, well-trained workers who can think innovatively,’’ Mr Kelly said. Mr Kelly said he hoped companies like Boeing would follow the example of Saab Australia, PMB Defence and Century Engineering to partner with schools to ensure the industry needs and workers’ skills match-up to create a vibrant future jobs market in Adelaide. StPatsTech is located in Edinburgh North and specialises in teaching years 11 and 12 students who are seeking a trade or apprenticeship after school. 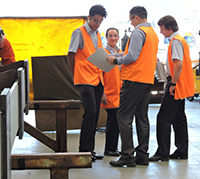 The College’s successful pre-vocational training program means students graduate with their SACE and a Certificate II in their chosen trades. The school is also well-known for its School-based Apprenticeship program, which enables students to complete their first year of an apprenticeship while also completing their SACE. As a specialist school, StPatsTech tailors classes and teaching to ensure students do not miss out on core literacy and numeracy subjects while gaining valuable work experiences. Its strong industry links and partnership with TAFE SA means students leave StPatsTech prepared to enter the workforce or go onto further study. This entry was posted in Latest News on 06/04/2017 by St Patrick's Technical College.